That's tough. I've looked myself in an effort to configure my tablet as a mobile gaming book and did not find anything I liked when I did. Maybe screenshots of the dicelog result instead of copy/paste? or just be on the honor system. nobody checks how many times you roll dicelog and which result you c\p. I use this on my phone and cop/paste easily. I just rolled a 427 on my saving throw, does that hit?!?!?! Cyc makes his save vs poison. Drusus steps forward and swings his moonlit sword, bleeding the croaker right smartly. The mucker double-hops from E-17 to the watery space at L-15. Bru is now even more surrounded. Will post tonight - pretty locked up getting things moved into the new place. BTW, called it quits for good with Nicole last weekend. Sad but actually feeling pretty good about moving forward and building a new life. Quxx moves to K-12 and hits that special looking dude at K-14 with GUIDING BOLT. Quxx's Guiding Bolt is a hit. However, his movement to K-12 is not doable. He only has 30' movement and allied/enemy occupied squares are difficult terrain, 1/2 speed. The fungus patches are also difficult terrain. Please state a legal move for Quxx. If he can target from where he is, he'll stay put. If not...H-12 should give me LOS? Quxx moves to H-12, where he has direct LOS on Uggloor. He stings the brute with a magical beam. Leaper 1 attacks Bru with a bite and misses. He jabs with the spear and hits with a 19 to AC! Bru suffers 9 piercing damage. Leaper 2 hops to the water in K-15. He takes a bite at Bru and hits with a 20 to AC! Bru suffers 3 piercing. He also jabs with a spear, but misses. Huron hightails it out. He scurries off the map (somewhere around S-20). Sorry guys. Been buried alive this week. Leirthal moves to I-13. He should be able to skirt a cone right down the line to get the 3 baddies adjacent to Bru without hitting Bru? If not he will ready instead of casting and command, "Bru out of there!". It is clear that he intends to let loose whether Bru moves or not. (Feel free to ready attacks for after Leirthals, but y'all are put on notice that his action is readied for the end of Bru's turn regardless of the position of Allie's). "I'm serving boiled frog's legs for dinner!" Leirthal manages to catch the three frogmen in a 15' cone. Uggloor makes his save (14), so takes 1/2 damage. He suffers 6 fire damage. Leaper2 fails and takes 12 damage. Make a ranged spell attack against the target. 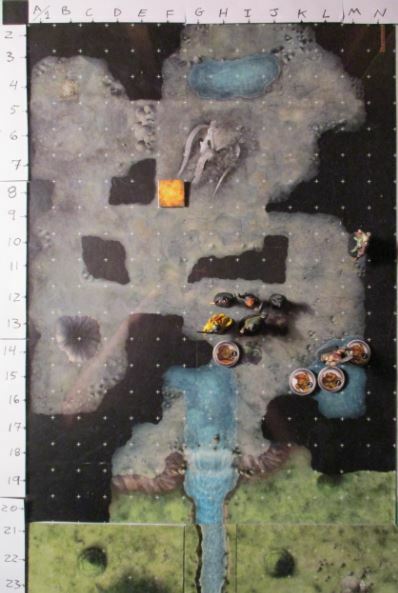 On a hit, the target takes 4d6 radiant damage, and the next attack roll made against this target before the end of your next turn has advantage. Cyc will stay put for now. Finished. Cyc eliminates Uggloor's champion existence with a well-placed guided bolt. The froggy thug is vaporized (much like his leader was) by searing hot combat magic. Dayyyuuum! The heroes crowd in as the bullywugs begin to realize that the tide is turning against them. They wonder if perhaps they will take the big guy down before the end. Ara is up. His current position is at M-10 (one space north on Chris' map). *Hey guys, I will be gone thru Monday (at a lake cabin). 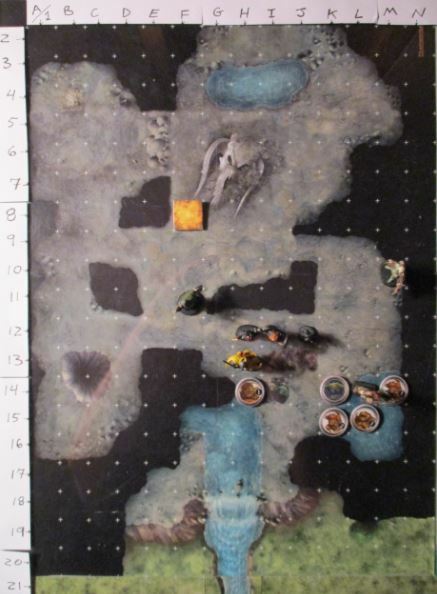 Will have access to internerd, my computer, notes, and PHB, but not my battle map. Chris has that covered hopefully. I do appreciate the team effort on this game! "Clearly he was weakened severely by my flames. Who can defy such powerful magic!?" I realize it's difficult to lock people down on the weekends. Still, I don't intend to run this module forever. Moving on. Ara eyes the two froggies at K-15 and L-15. He starts his move to I-17 and he s passin through I-15, he losses his first arrow at L-15. If that hits, he quick snaps a second arrow at froggie at K-15 when he gets to I-17. when Ara gets to I-17, he checks to see if the little guy is still in sight over the cliff. "Nok, we should go help the little guy" Ara shouts, and then pulls his swords and checks his six in case he needs to defend himself. Froggy at L-15 is a mucker. He enjoys 3/4 cover standing behind Bru. Ara still manages to hit him with an arrow. The mucker is still up. Froggy at K-15 is leaper2 and takes an additional d8 of damage from Ara's critical hit. Result of the throw of dice "1d8" : 2. Bru takes 9 damage from Leaper 1, halved to 4 and 3 damage from Leaper 2, halved to 1 thanks to his rage. Total of 5 damage. He holds his shield aside as he swings his battleaxe across the form of Ara's first target, the mucker at L-15. He doesn't expect much to come from his attempt, but sometimes he even surprises himself. Result of the throw of dice "1d20 +5" : 20 + 5 = 25 Perfect timing! Additionally, Bru gets to roll an extra damage die on crits due to his savage attack. Total of 20 damage dealt. Bru lets loose with the most primal howl he can muster. If his savage, rage-fueled, perfectly timed strike falls the mucker, he will advance into the space previously occupied by his target. 5' to L-15 and that completes his turn. Bru completely bisects the mucker. Frogman lays slain. Croaker stays put and spews another Foul Croak, catching Drusus, Quxx, and Cyc in a 15' cone. 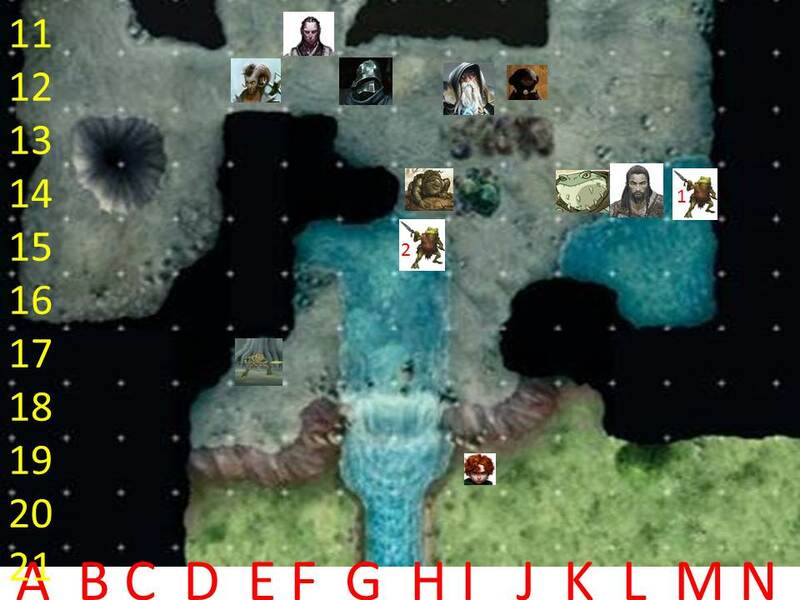 Need CON saves from Drusus, Quxx, and Cyc..
Nok is more concerned with the 3 remaining froggies than finding the kid. "Ha ha, you lead-footed amphibian!" Drusus made his save vs poison. Nok puts a quick end to the already bleeding profusely leaper. Still need CON saves from Quxx and Cyc..
With a mighty swing, Drusus slays the croaker. Will post action after the results of my failed save are resolved. That is a fail. Poison damage. Pass! Cyc makes his save. And responds with a similarly venomous intent, launching crackling bolts of wicked blue lightning at the big ugly located on the 14 line near our big cluster. The croaker had just been slain by Drusus. However, Quxx can still target the last remaining leaper. The bullywug is within range, but also enjoys 3/4 cover, due to Bru's hulking form standing in front (not to mention Leirthal's big head in front of Quxx). However, Quxx manages to land a hit with the Witch Bolt! The already-arrow shot and ensnared leaper succumbs to the warlock's lethal blue beam. The froggy raiding party is all dead. Combat is over! Ara looks out from the cave mouth. He doesn't immediately see the halfling boy, but the wood elf ranger highly doubts Huron would have gotten far. He was very tired-looking. Leirthal cares not for the boy. The others can concern themselves with him. He begins to search for a way into the dragon skull. navyik wrote: Leirthal cares not for the boy. The others can concern themselves with him. He begins to search for a way into the dragon skull. There is a large enough hole in the back of the skull, for Leirthal to squeeze inside. It is the hole where the skull would have connected to the dragon's spine. Inside the skull he finds a stinking pile of burnt rags, smoldering flesh, and charred bones. Likely the remnants of Gloorpk? Beside the pile is a quarterstaff fashioned from bone. yeah, Drusus will also look for precious loot. Nok will call out to the boy and make himself visible at the cave entrance, "Huron! Huron, lad. We are here to help you. We won't hurt you." Bru surveys the state of the cave post-battle, wondering if these were the only bullywugs. "Taking care of these lot should free up some allies, eh fellas? What's the story with the boy?" Chris wrote: Nok will call out to the boy and make himself visible at the cave entrance, "Huron! Huron, lad. We are here to help you. We won't hurt you." The party hasn't actually yet been introduced to him. They don't know his name. More meta-knowledge provided by your humble DM.. Nonetheless, once Huron sees Ara and Nok emerge from the cave he comes out of hiding. "I hoped you would prevail," he says. "Two friends and I were out hiking by the White River, when the bullywugs ambushed us. They were hiding along the muddy shore. My friends escaped, but I wasn't so lucky. Will you help me get back to my clan? I am a Reedfoot." 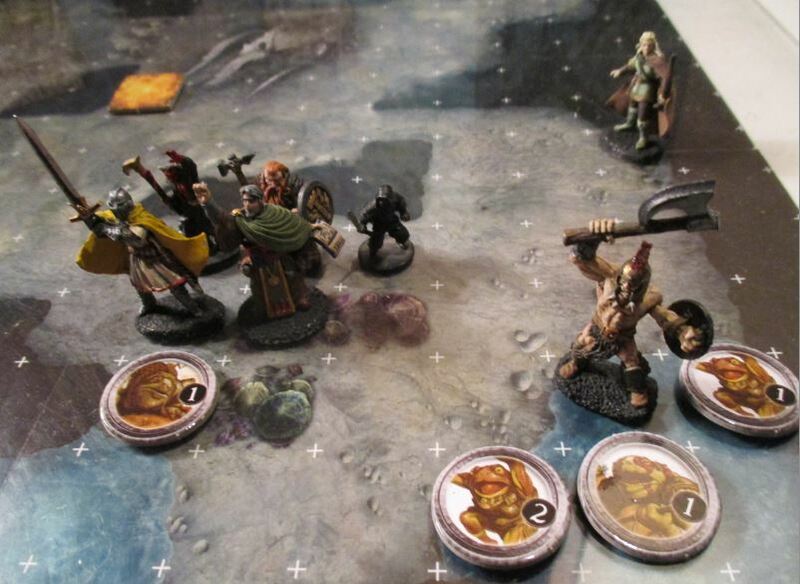 Drusus finds on one of the bullywug leapers a leather satchel containing 30 gp and 100 sp. Uggloor has a belt pouch containing 15gp, 60 sp, and a flawed emerald worth 100 gp. The bullywugs carry sacks of plundered foodstuffs and supplies including fish and dried meat. Other than their weaponry and armor, he doesn't readily find anything else of value. However, they might have something hidden in the hole (B-13) where the oozes emerged, or the pile of skulls (B-4), or possibly one of the pools in the caves. Bru doesn't notice any signs of additional or approaching bullywugs. Leirthal will examine the staff. Bru hears the familiar sounds of Nok in distress and walks over to the pit peeking his head over the edge. "We are happy to have balanced the scales. Do you know if there are more of these creatures?" What exactly is Leirthal trying to determine? Arcana is not Detect Magic. I guess for starters, he recalls some lore regarding magic bone staffs and their darkside implications. The wizard suspects the staff could possibly be magical, or at least, a focus for chaos magic. Nok falls into the pit, but he doesn't hit bottom. He's gone into The Void.. Seriously though, the party should decide their next move. Robyo wrote: What exactly is Leirthal trying to determine? Arcana is not Detect Magic. I guess for starters, he recalls some lore regarding magic bone staffs and their darkside implications. The wizard suspects the staff could possibly be magical, or at least, a focus for chaos magic. Leirthal will cast detect magic. 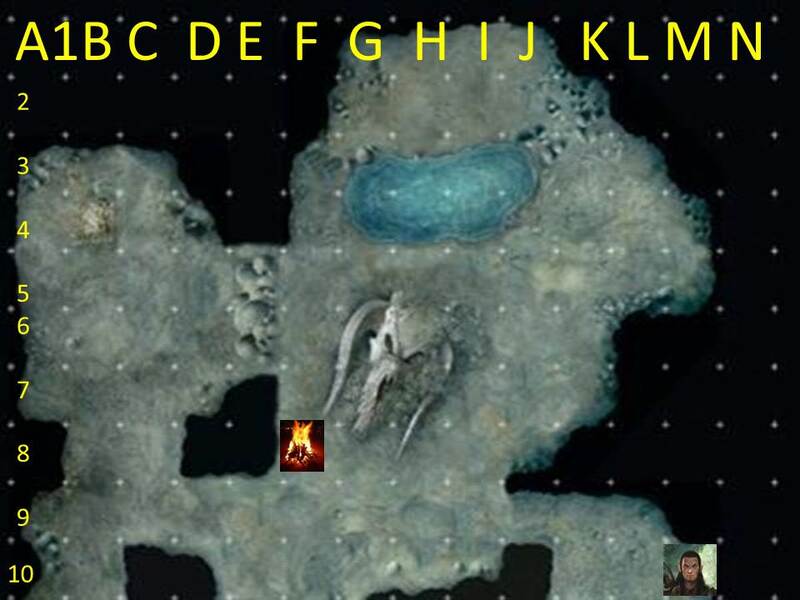 He will first look at the staff, but also search around the cavern for auras. Once it is searched properly, he will check on Nok and then suggest we take the rescued boy home. 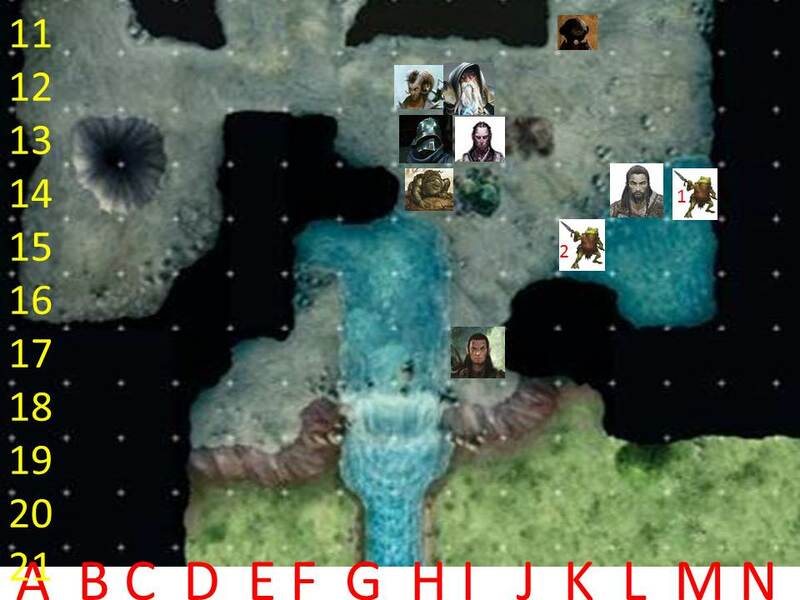 Cyc finds a rock to sit on to catch his breath and surveys the cave, dead creatures, and his friends going about the business of plundering the bullywugs’ lair. “All right lads. Well done! That’s worked up my appetite. I reckon Tor’s descendants are owin’ us a tasty lunch fer clearin’ this lot outta here. Fish Nok from that privy and let’s be on our way.” With that, Cyclone grunts as he gets back on his feet and heads to the mouth of the cave to begin the climb down. Nok searches the bottom of the slime pit hoping for some trinket to warrant his fall. "Uh.... wait.... look what I found!" he proudly holds up anything he finds, even if it is just a slime-coverd rock!